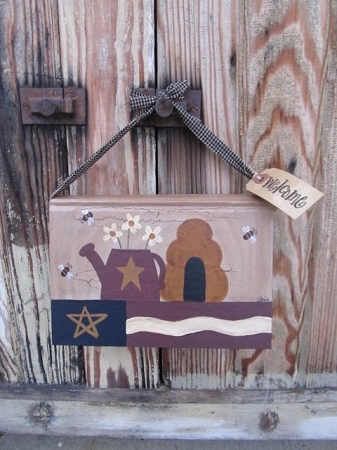 Primitive Americana Summer Thyme Hand Painted Hanging Vintage Book. This book design is thanks to my dear friend Lori. She liked the design from my personalized sign that I did, and wanted it painted on a book. A great design for summer. The base of the book is painted like a flag. Painted above is a Burgundy watering can with 3 cream colored daisies, little bees flying around and their hive painted alongside. Homespun fabric is tied inside the book so it can hang up. The book also comes with a little primitive paper tag that has a saying on it, this one reads Welcome. Pick your favorite out from the list of options. I repurpose hardcover books, so no two books are the same. Most are around 8"x5". Hand painted, designed and signed by Heidi.